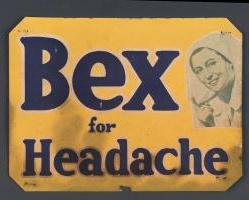 “Have a cup of tea, a Bex and a good lie down,” advised advertisements for Bex, a cure-all manufactured from 1965 by Beckers Pty Ltd manufacturing chemists in Sydney. Bex was recommended for headaches, colds and flu, all nerve pains, rheumatism, and for “calming down” the overexcited. Bex powders were taken by dissolving them in water or a cup of tea, and some people took as many as three powders a day. Aspirin – Chemically known as acetylsalicylic acid, this drug acts on the body as an anti-inflammatory, helping to alleviate pain, fever, headache and other symptoms. The maximum recommended daily dose of aspirin is 1 g (1000 mg), as it can lead to stomach bleeding. A single bex powder (approximately 1 gram) contained 420 mg of aspirin. Phenacetin – This chemical was widely used with aspirin and caffeine as a fever and pain reliever. It acts primarily on the nervous system, targeting the sensory tracts of the spinal cord, the brain and the heart. It was withdrawn from use in 1983 due to its damaging action on the kidneys and carcinogenic properties. Each Bex powder contained 420 mg of phenacetin. Caffeine – Found in coffee, tea and soft drinks, caffeine is a powerful nervous system stimulant. In combination with aspirin, it can give greater pain relief than aspirin alone. More than 250mg of caffeine a day can lead to unpleasant side effects like sleeplessness, irritability and heart palpitations. A single bex powder contained approximately 160mg. In the 1960s, housewives routinely used Bex to get through the day. However, once it was recognised that these substances were addictive and large doses of phenacetin taken by habitual uses were resulting in widespread kidney disease, analgesics came under government regulation in the 1970s (1). Watch a Bex TV advertisement from 1965 here.